Eight Victorian councils including the Horsham and Ararat Rural Cities, and the Southern Grampians, Glenelg, Northern Grampians, Yarriambiack, Hindmarsh, and West Wimmera Shire Councils, have combined to launch a comprehensive public transport strategy as the first step towards lobbying for improved rail and coach services to boost business, tourism, health and education in Western Victoria. The study which was released in March recommends increased passenger rail and coach services between Ararat and Melbourne and return of passenger rail services to both Horsham and Hamilton. It also recommends extra coach services to improve connections between road and rail services across the Wimmera and Western Victoria and into South Australia. A V/Locity passenger train at Ararat. In 1985 or 1986 this steam special was photographed at Jeparit on the Dimboola to Yaapeet branch. The photo shows not only the locomotive D3 639 which hauled the train, but also the 'Jumbo' grain silo under construction to the left, the station building that was demolished soon after, and the wires that were used to activate the signals protecting the approaches from the Yaapeet and Yanac lines at the down end of the yard. This photo was contributed to our collection without any additional information - any more details about anything in the picture, particularly the special train and the date, would be welcome. You can comment on the photo on our Facebook page by clicking here. - Fri 27 Dec 2016. During late October and early November, the Australian Rail Track Corporation undertook a ballasting program on the western standard gauge line. The train was loaded at Maroona and Glenorchy and travelled to discharge ballast at various locations between the up side of Tatyoon through to the South Australian border. The work area will move across the border into South Australia once completed in Victoria. Pacific National are providing the hook and pull services with locomotive 8139 hauling a rake of 22 ADFF hoppers with an NDPF van at each end. - Thurs 3 Nov 2016. 8139 leading a ballast train heading west out of Nhill on Wed.2.11.2016. As part of the project to extend a number of crossing loops between Melbourne and Adelaide work is underway at Pimpinio Loop this week. The original turnout at the down end of the loops has already been removed and the number two track extended just over 300 metres to make it long enough to hold 1,800 metre trains. The superseded signals are being removed and their replacements will be commissioned before the loops is again made available for crossing trains by the end of the week. - Wed 29 June 2016. GrainCorp has welcomed the Victorian government's recent announcement of $8.5 million to upgrade State-owned rail sidings at major grain silos around the State. Five railway sidings in the Wimmera will be amongst seventeen throughout Victoria and Southern New South Wales that will be upgraded. The investment by the Government will address lost time and poor train utilisation caused by slow train loading facilities at country sites, and inefficient track layouts at most sites that require excessive shunting. This complements GranCorp's Project Regeneration initiative which will see them invest up to $80 million to improve their infrastructure to enable quicker out loading of the grain into trains. The local sites to benefit from this funding are Beulah, Murtoa, Nhill, Rainbow and Warracknabeal. GrainCorp's Regional Manager for Victoria, Peter Johnston, said the investment would deliver significant benefits across an important regional industry. "The Victorian government's investment complements GrainCorp's own investment of up to $80 million across key sites on the Victorian rail network. These upgrades will deliver improved rail efficiency for the users of GrainCorp's open network and reduce costs," Mr Johnston said. "The primary beneficiaries of this investment are Victoria's grain growers, as greater rail efficiency will unlock at least $5 per tonne that goes into their pockets through sharper prices for their grain. "The many customers using our network will also benefit from significantly improved rail efficiency, allowing them to get Victoria's crop to its destination as quickly and efficiently as possible. "Local communities will see a major reduction in heavy vehicle movements as around half a million tonnes of grain each year is returned to rail. This means less wear and tear on local roads and improved safety. "Investment in the government-owned rail infrastructure is critical to GrainCorp's ability to deliver the benefits of our major Project Regeneration initiative. We are pleased to be able to partner with the Victorian government to deliver these outcomes and we congratulate them on their proactive approach and vision to grow one of Australia's most important industries." The first train to load grain at the Bow Hill facility north of Rainbow in September last year. Rainbow is one of the five locations in the Wimmera that will benefit from this funding announcement. The Australian Rail Track Corporation (ARTC) are currently undertaking two significant infrastructure projects in the Dimboola area on the main Melbourne to Adelaide railway line. Pimpinio Loop, between Dimboola and Horsham, is one of four crossing loops on this line that are being extended to facilitate more efficient timetabling of 1800m long trains. The others include Pyrenees Loop near Ararat, Murtoa Loop, Diapur Loop and Mile End in suburban Adelaide in South Australia. The work to be carried out at each site includes earthworks, construction of additional track sections, installation of new turnouts and the repositioning of signalling equipment and installation of new LED signals. Work began in October last year at Pyrenees Loop with the required earthworks, with the equipment to undertake this work moving west as this task was completed at each site. This was followed by the installation of the track and eventually the signalling and commissioning. It is anticipated that Pimpinio Loop should be completed by April this year, and the whole project completed by July. The second task is the replacement of the steel deck on one of the rail bridges that span the Wimmera River at Lochiel. The railway line is carried over the river on a series of five bridges with embankments in-between, with the fourth span from the east crossing the main channel. The bridge being upgraded is the one to west of this. Lochiel bridge number 5 which is having its deck replaced. The following article appeared on our sister website the Dimboola Courier on the 13th of December 2015. Rail traffic through the Wimmera was disrupted for over eleven hours today when a Melbourne bound train carrying intermodal containers and operated by Aurizon came apart near Pink Lake soon after 9 am this morning. The train came to a stop blocking the River Road level crossing after three wagons were damaged and the rear bogie of one became derailed. A road crane arrived on the scene at around 2.45 pm which was used to re-rail the wagon and reposition a container on another wagon. No significant track damage was observed. The three locomotives along with the front ten wagons, which included one of the damaged ones, were cleared to leave the site at about 5.30 pm and they proceeded to Dimboola where the wagons were stowed whilst two of the locomotives returned to Lochiel to collect the remaining damaged wagons and take them to Dimboola. The locomotives then returned for a third time to collect the remainder of the train and clear the line, allowing the backlog of trains waiting further west to continue their journeys towards Melbourne. The railway line to Mildura was blocked for the second time in two months when a loaded grain train derailed when entering the Ouyen yard late in the afternoon of Tuesday the 30th of December. The train, operated by Pacific National as train number 9156, consisted of locomotives G542 and XR554 hauling forty loaded VHGF grain hoppers. These had been loaded earlier in the day with wheat at Carwarp, between Ouyen and Mildura, and were destined for unloading at the Geelong GrainCorp terminal. At about 17.15 the train entered the Ouyen yard, slowing to a stop for a crew change at the station, when a wagon near the centre of the train derailed. This derailment significantly damaged the track for about 170 metres from the down side of the level crossing into the yard. The train came to a stop blocking Williams Street. At around midday the next day the undamaged front portion of the train was separated from the damaged hoppers as the clean-up began. By this time, many investigators and recovery workers had arrived on the scene along with three road cranes, a truck load of replacement bogies and truck load of new rail. Plans were being formulated to unload at least fourteen of the damaged hoppers before they could be cleared off the line to allow the track to be repaired. Six hoppers at the back of the train appeared to be undamaged, but as there are no locomotives north of Ouyen, these cannot be moved until the track is repaired. In the yard the two locomotives were separated with XR554 remaining on site to assist with the recovery operations, while G542 was coupled to the intact twenty hoppers and departed for Geelong at 14.42. It is anticipated that it will be well into next week before the line can be reopened. Due to embankment repair works at Berrybank in Victoria and upgrades to the tunnel at Ambleside in South Australia, no trains will operate between Melbourne and Adelaide between late on Fri.25.12.2015 and early on the Tues.29.12.2015. As a consequence of the derailment of SCT's PM9 derailed between Rawlinna and Nareetha in Western Australia, the Trans-Australian railway line has been closed since last Friday afternoon (4.12.2015) and is not anticipated to reopen before Thursday evening. A flow on effect of this closure is the reduction in standard gauge rail traffic through western Victoria with only Adelaide-bound and intra state traffic still running. One exception to this was the irregular light-engine movement of Qube's GML10 which departed Melbourne on the evening of Sun.6.12 as train number DMY1. This locomotive is reportedly destined for Whyalla in South Australia to collect and return with a rake of surplus ore hoppers that are to be used on the train servicing the Hansen Quarry near Kilmore north of Melbourne. With a poor grain harvest winding up and no grain ships due in Portland in the next month, grain trains have also become rare in recent times. This leaves the Hopetoun to Hamilton mineral sands trains and the SCT Dooen-Appleton Dock services as the only regular intra state trains on this part of the system. This is a picture of GML10 from the 9th of March 2012 when Qube used this locomotive (and occasionally a couple of 80 class units) to operate a train servicing Horsham. Empty car movement 9L89 hauled by TL152 nearing the end of its journey as it passes through Wail minutes before arriving at its destination at Dimboola on the afternoon of Sun.22.11. The long awaited C's on the North East Tour operated on Sat.21.11.2015 utilizing Seymour Railway Heritage Centre's C501 on its first passenger train since restoration and GreenTrains' C510 along with Steamrail's standard gauge passenger rollingstock. The tour ran from Melbourne to Albury and return and necessitated two empty car movements to position the passenger coaches as they are presently based at Steamrail's Dimboola depot. These transfers were hauled by K & AB Rail's locomotive TL152, with the up train operating on Thurs.19.11 and the return trip undertaken on Sun.22.11. The Australian Rail Track Corporation has commenced a project to lengthen five crossing loops between Melbourne and Adelaide to allow for the efficient operation of 1800m long trains on this along this line. Loops at Pyrenees, Murtoa. Pimpinio and Diapur in Victorian and Mile End in South Australia will all receive the necessary earthworks followed by track and signal construction with the improvements coming on line progressively between the end of this year and the middle of 2016. The down end of Pimpinio Loop, between Horsham and Dimboola. The twice-weekly Overland service is in question as of the end of this year. Discussions are currently underway between the operator and the respective state governments to consider the future of the service. This comes within months of a social-media push by Horsham residents for a more regular rail service to return to the Wimmera. The Overland was reduced from thrice-weekly to twice-weekly in August 2013 following a decline in patronage. Public Transport Victoria's Adelaide Daylink service currently offers Wimmera residents a once-daily trip between Melbourne and Adelaide via Bendigo using a coach, while numerous other coaches service other Wimmera towns including Nhill, Dimboola, Horsham and Murtoa numerous times a day. These services connect with others to transport Wimmera residents to Melbourne. A recent social media push for increased public transport in the Wimmera by means of a train between Ararat and Horsham has been met with strong popular support, and the support of local councillors. While there is strong support for the return of rail services to the Wimmera, a number of people commented online about the logistics of such a service, including the change in gauge of the line at Ararat. The current VLocity service is seen here at its terminus, Ararat. This comes within two years of The Overland services being decreased to twice-weekly in each direction between Melbourne and Adelaide following a decrease in patronage. July 1998 saw the service reduced from daily in each direction to five services per week, with the Wednesday and Saturday night services cancelled. August 2008 saw the allocation of 12 seats per train for VLine customers, allowing the use of VLine purchased tickets to connect between Melbourne and Adelaide by rail. Then Victorian Member for Public Transport Lynne Kosky said that "Under this agreement, passengers travelling between these western centres and Melbourne will be able to purchase a ticket through the V/Line reservation system, with fares equivalent to other sections of the V/Line network." The number of seats for VLine customers was increased to 64 in late 2010 when the train began stopping at Stawell. The thrice-weekly service was reduced to two services in each direction in August 2013. NR121 is seen earlier this year departing Dimboola at 1.20pm for the Saturday Melbourne to Adelaide Overland service. A downturn in grain exports is being blamed for the loss of over thirty train driving jobs across western Victoria. Pacific National have notified staff that 14 drivers at Maryborough, 12 drivers at Dimboola, four drivers at Ouyen and two in Geelong have two weeks to consider redundancy options. A Pacific National spokesperson told the Weekly Times that "Regrettably, following this a decision has been made to reduce the number of train crew positions at our Victorian depots. "Pacific National has now commenced the consultation process as part of this change, and is working with affected employees to discuss applications for transfer to available vacant positions in other parts of our business, along with applications for voluntary redundancy." A freight train consisting of 34 wagons was damaged at Stawell on the evening of Monday 1.6.2015. The Age reports that the train hit two steel bars on the tracks, "which police believe were deliberately placed," which caused extensive damage. 5,000 litres of diesel fuel was lost as a result, and the train was shunted back to the Stawell railyards for repairs. The Stawell Times-News reports that two men have been charged following the incident in Stawell on Monday night. Ararat Crime Investigation Unit Detective Marcia Parry said that the estimated damage and repair bill is around $70,000. Detective Murray told the Times-News that "The act in itself is extremely dangerous and could have caused grief to a lot of people, not just the train and the tracks." After the demise of El Zorro early last year, the Seymour Rail Heritage Centre purchased their three TL class locomotives that were at that time at Portland. These locomotives along with GM36 and a number of items of rolling stock were transferred for further storage at Dimboola on Fri.16.5.2014. One of the TLs was on sold to K & AB Rail, and all four locomotives remained stored at Dimboola until April 2015. On Friday 24th and Saturday 25th GM36 and TL152 were started up and used to shunt some of the stored rollingstock from around the Dimboola turntable to eventually make up a train consisting of TL152-GM36 and a number the coaches. The train departed on the morning of Sun.26.4 and paused briefly at Glenorchy to attach the empty container flats that were stored there. The train spent the night in the SCT sidings at Laverton before continuing to Seymour the next day. The return journey commenced later that day with TL152 hauling five of Steamrail's standard gauge coaches destined for their depot at Dimboola. The train once again spent the night in Melbourne and after collecting locomotive 845 departed west the next morning. A delay was caused by problems with the TL at Barwon Loop, west of Geelong, but after that was remedied the train continued and arrived at its destination after dark. Locomotives TL152 and GM36 were being prepared to run a rollingstock transfer to Seymour the next day when photographed near the Dimboola turntable on Sat.25.4.2015. Usually captive of Mineral Resources Limited services in Western Australia, locomotive MRL005 made a brief visit to Pacific National's Spotswood maintenance centre in Melbourne during April. This locomotive travelled east behind NR13 and NR34 on XM2 which arrived in Melbourne in the evening of Tues.21.4.2015, and returned as NR34-MRL005-NR13 on 5MP2 which passed through western Victoria on the afternoon of Thurs.23.4.2015. Locomotive MRL005 as part of the motive power for 5MP2 pausing at Dimboola for a crew change on the evening of Thurs.23.4.2015. After nearly nine years of storage in the siding at Antwerp (north of Dimboola on the Rainbow branch), the rake of twenty one VHBF grain hoppers are being removed. They were placed at this location late in June 2006 and have remained there ever since, only leaving the siding briefly on at least two occasions when they were hauled out onto the main line only to be immediately pushed back into the siding which was to prevent the bearings seizing up. On the morning of Tues.24.2.2015 a large fork lift was being used to lift the hoppers off their bogies and place them on the ground and the bogies were also being taken off the rails. This work had been completed by early afternoon, with all hoppers lined up at on the ground at the down end of the yard and the bogies in a number of clusters around the yard. Later in the day the task of hauling away the hoppers had begun with a number of them being loaded onto road trucks. Qube's first foray to western Victoria for February occurred on Wed.18.2.2015 when locomotives RL306 and RL310 combined to haul a rake of 40 hoppers to Nhill for loading. The Appleton Dock bound loaded train is seen here sweeping around the curve east of Kiata, at the location of the SCT train derailment in January 2002. The mineral sands train from Hopetoun to Hamilton resumed running for the first time this year on Mon.2.2. 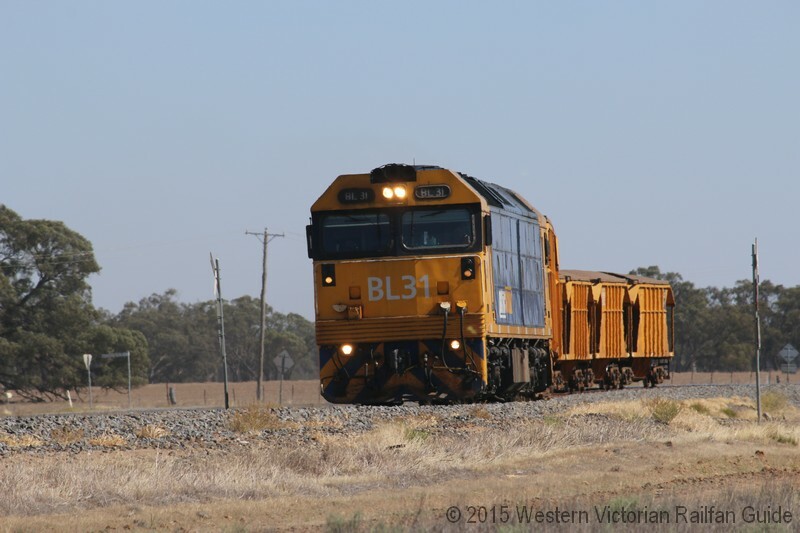 The train was hauled by BL31 with a reduced loading of 12 hoppers and departed Hopetoun at 9:15am. Iluka announced last year that operations at their mine near Ouyen are scheduled to cease during February 2015, but the development a new mine near Balranald in New South Wales will continue to provide mineral sands that will continue to be transported by road to the rail loading facility at Hopetoun and from there railed to the mineral separation plant at Hamilton. BL31 continued to haul this train until around Wed.11.2 when it was reported as part of an up three loco combination heading towards Melbourne that morning, and G540 was sighted on the mineral sands train. Despite a disappointing 2014 harvest in the northern Wimmera, the New Year has seen some grain begin to move on the rail system. As of the 20th of January the Hopetoun to Hamilton mineral sands train has not resumed running since the Christmas/New Year break, although the Kalari trucks have commenced transporting product from the mine to the Hopetoun rail loading facility. The train last ran on Wednesday 24 Dec 2014. A number of grain trains have also run on this line during December and January, and as expected, the motive power has come from the G and 81 classes. The following are the locomotive combinations reported on grain trains at Hopetoun.- others have operated only as far as Warrackside and Beulah but their details have not been reported. Thanks to our Hopetoun correspondent for this information. Qube Logistics hired C501 to replace a defective GL class locomotive for a run to Nhill on Thurs.15.1 to load, forming a double header with GL109. The Rainbow branch has also seen a burst of activity, with a number of grain trains operated by Pacific National hauled by their G and 81 class locomotives. For most of last year the only grain receival site on the branch serviced by rail has been the current terminus at Rainbow, as two rakes of hoppers were placed in storage in the yard at Jeparit (the only other active site on the line) in March preventing trains from loading there. These wagons were removed early in the second week of January and at least three trains operated on the line in the following six days. The first one sighted was on the afternoon of Mon.12.1 when 8101 and 8116 were reported hauling 20 hoppers in the up direction through Antwerp at 15:15. The loading location for this train has not been confirmed, but it is likely that it was Jeparit. Three days later on Thurs.15.1 a lone 8116 was assisting the loading of a rake of hoppers at Jeparit at 8.30 in the morning. Another visit occurred on Sat.17.1 with 8116 and G538 arriving at Jeparit at around 7.20 in the morning and departing at around midday after their rake of hoppers was loaded. This year should also see further development of GrainCorp�s Bow Hill storage site, just north of Rainbow, to bring to fruition their plans to use the adjacent �booked out� Rainbow to Yaapeet section of the line to load trains from planned over-rail loading bins. These improvements will allow trains to be loaded quicker which in turn will lead to better utilization of the line. QUBE Logistics loaded a train at the Dimboola GrainFlow Centre on Thursday the 18th of December, with hired CFCLA locomotives CF4004 and CF4402 providing the motive power. This was the third train operated by QUBE to load at this location during December, with GL107 and GL109 leading a train on Wed.10.12 and the same two CF class locomotives hauling at train on Fri.12.12. Pacific National also loaded at Dimboola during the third week in December using G520 and 8101 to haul their train. V/Line's IEV100 paid a visit to the Wimmera over the weekend of the 6th and 7th of December where it was used to evaluate both the Murtoa to Hopetoun and Dimboola to Rainbow lines. The unit was stabled overnight at the Wimmera Intermodal Freight Terminal. The Iluka mineral sands train that operates between Hopetoun and Hamilton continues to operate although recent time have seen its length reduced and it is regularly hauled by a single BL, G or 81 class member. The last week of October saw the first trains operate on the Rainbow branch since June, when Pacific National's 8101 made two trips north from Dimboola. September 2014 marks fifteen years since the Western Victorian Railfan Guide was launched with the aim of providing a place to record the railway happenings in the west of Victoria. The main focus is on the main standard gauge link between Melbourne and Adelaide and the associated branches to Portland, Dunolly, Hopetoun and Yaapeet (Rainbow), along with the occasional mentions of the north western broad gauge network and across the border in South Australia. Over this decade and a half the railway scene has evolved which a quick look through our News Archive and Photo Gallery pages will highlight. We wish to acknowledge and thank our team of contributors and photographers who have provided the information and pictures that have made this a dynamic record of the changes in this small part of this important industry. We also encourage these contributions to continue as the more information that we receive, the more informative this resource will be. We consider this picture one of the best contributed to this site, and is of the up Saturday Patricks' service (7AM3/9756) climbing the Diapur bank at 16.16 on the 23rd of October 1999. Upon receiving word that this train would feature an interesting motive power lash-up, the opportunity was taken to try a new photographic location - the cuttings to the west of Diapur, between Nhill and Kaniva. Some time was spent finding a good location but after a very long wait with no action and with rain clouds brewing, the gear was reluctantly packed up at before 16.00 and the trip home commenced. Only a matter of minutes later a message on the scanner confirmed that the train had just crossed the border, which sparked a frantic dash back to the chosen location and a quick set up in some light rain to capture the picture that you see here. The train was hauled by the colourful combination of CLP8, CLF7, GM27, T373 and T381 in Australian Southern Railroad, Australia National and Great Northern colours. Work has commenced on the upgrade of the Murtoa to Hopetoun branch line that was announced in the state budget earlier this year. A V/Line maintenance gang commenced work at Hopetoun on Tuesday August 26 replacing expired sleepers starting at the Iluka siding. Various track machines have been reported on this line over the past few weeks undertaking preparations for this work. Sleepers have been stockpiled at Hopetoun and a number of level crossing further south and marking on the line indicate that approximately one in three sleepers will be replaced. An unusual movement occurred on Monday the 18th of August when Aurizon's G534 was reported heading east from Dimboola after 8:00 in the morning as a light engine movement. It was heading to Murtoa where It collected the repaired wagon that had caused the mishap the previous week near Lubeck. The locomotive along with a single container wagons with two containers had returned to Dimboola by 13:00. After a brief delay this small train continued out to Dimboola Loop where it was shunted back into the down end of the AWB GrainFlow Centre�s siding and shut down, presumably to await collection by the west-bound Aurizion service MP1 later that evening. The 11th of July 2014 marks the tenth anniversary of the return of V/Line passenger services to Ararat after a break of ten years. The Ararat service was the last of a list of long distance intra state passenger services that were suspended between July 1993 and May 1994. Most of the affected services were discontinued in August 1993 but passengers from Ararat gained a reprieve due to an upgrade program then currently underway on the Western Highway between that city and the intended new terminus for these trains at Ballarat. It was feared that due to these roadworks the new road coach services would be slower than the trains that they replaced. The last locomotive-hauled V/Line passenger train departed Ararat on the 27th of May 1994 from which time no passenger trains ventured beyond Ballarat on the broad gauge. After ten years, passenger trains to Ararat resumed in July 2004 and were initially operated with Sprinter railcars before the newer V/Locity railcars that now run the service took over. During the ten years without an intra-state service, the Overland that operates between Melbourne and Adelaide continued to run on the standard gauge but this has been reduced from a nightly in both directions service on the broad gauge prior to 1995 to the twice weekly in each direction train that operates today. GrainCorp's recently announced Project Regeneration appears to have a mixed implications for the western Victorian rail network. The negative of many of their smaller outdated grain receival sites either closing or remaining closed is contrasted with a renewed commitment to the use of rail for clearing many sites. Some locations, such as Rainbow's Bow Hill facility, will benefit from new or upgraded rail loading facilities allowing trains to be loaded quicker although others will remain as road out loading only. From the details on the GrainCorp website the sites to remain active on the western standard gauge rail network include Berrybank, Westmere, Murtoa, Nhill and Lillimur on the main line, along with Jeparit and Rainbow on the branch north of Dimboola and Warracknabeal, Beulah and Hopetoun on the Hopetoun branch and Willaura and Hamilton on the Portland line. Active non rail-served sites include Yaapeet, Carpolac, Natimuk, Naracoorte and Goroke. GrainCorp are proposing to expand their Bow Hill grain storage facility north of Rainbow in the Southern Mallee of Victoria. Whilst specific details on the project are scarce, the aim would be to downgrade or close their silos within the Rainbow township and move all activity to the Bow Hill site which is about a kilometre north of the town. The currently 'booked out' section of the Yaapeet railway north of Rainbow passes along the eastern boundary of the current Bow Hill site and the proposal is to use this line to access a new rapid loading rail facility. 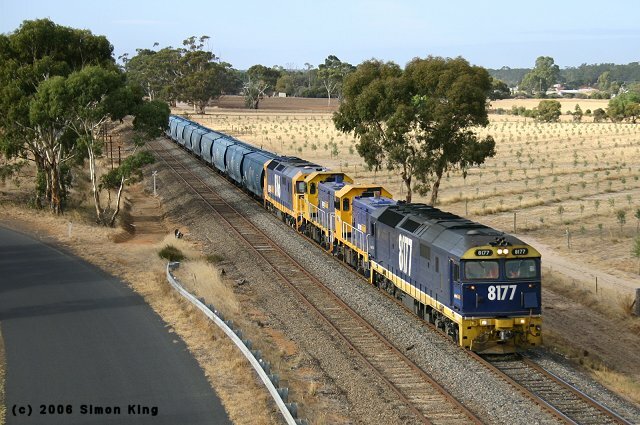 This could increase the amount of grain transported out of the area by rail and make better use of the recently up graded branch line north of Dimboola. There has been much written and said since the details of the state budget have become known, with the most relevant announcement for rail in western Victoria being the allocation of funds to upgrade the Maryborough to Mildura and Murtoa to Hopetoun railway lines. The first $41 million has been allocated to upgrading these lines to 21 tonne axle loads for an immediate increase the amount of freight carried on each train. The remainder of the funding is for a business study that will determine the best way to go about standardising the Mildura line if it is found to be feasible. The possible alternatives include standardising the current broad gauge route all the way from Geelong to Mildura through Ballarat and Maryborough, utilise the current link between Ararat and Dunolly and standardise north to Mildura or to create a new link between the existing western standard gauge system and the Mildura line either between Minyip and Litchfield or Hopetoun and Lascelles. THE rail line from Hopetoun to Murtoa will be upgraded as part of a $220-million rail upgrade. CFCLA's CM class made their first appearance in western Victoria on Sunday the 27th of April when three of the class, along with an EL, hauled a rolling stock transfer train to Dimboola. The train had originated in New South Wales the previous day and had stabled overnight in Melbourne. The train arrived at Dimboola at 14 05 where over the next couple of hours the four passenger coaches and three CP vans were shunted and positioned around the turntable by locomotive CM3310. After their overnight layover, the four locomotives departed for Adelaide just after 7 am the next morning as a light engine movement. The locomotives were CM3310, CM3309, EL62 and CM3308 and the rolling stock included CP35 'Dartmouth', CP, CP, 603 'Clarence', 604 'Wilsons', 605 'Brunswick' and 713 PCK. For the first time since Pacific National took over the hook and pull of the Iluka Hopetoun � Hamilton mineral sands trains from El Zorro in May last year (2013), this train has been hauled by a different class of motive power. For the last eleven months the train has been hauled exclusively by double G class combinations, but on Thurs.17.4.2014 BL26 and BL30 made their first run on this service. This was the first appearance of the BL class on the Hopetoun branch, although a member of the class did venture down the Portland line in the mid 1980�s when one was trialled on grain services when on hire from Australian National. The first train on the Rainbow branch for 2014 arrived at Jeparit at around midday on Saturday the 8th of March and consisted of G543 hauling a rake of empty grain hoppers. Upon arrival the crew split the rake and stowed half in each of number two and three roads before the locomotive departed as a light engine in the up direction at 13.16. HORSHAM Rural City Council will seek funding for a feasibility study as it continues its push for the reinstatement of passenger rail to the region. MORE than 700 containers are moving through the Wimmera Intermodal Freight Terminal each week. Wimmera Container Line general manager Allister Boyce said the containers were transported on nine weekly intermodal trains between Melbourne and Dooen. After the usual Christmas/New Year lull, rail activity has begun to pick up again in western Victoria as we move into January. An intensive track rehabilitation program in the Stawell area has been undertaken during this quiet period which will hopefully speed up trains through the section between that location and Pyrenees Loop. SCT�s own motive power has returned to the SCT/Wimmera Container Line service to the Wimmera Intermodal Freight Terminal (WIFT) at Dooen although there still appears to be some issues with the CSR class as they originally returned in tandem with the hired GL class and some recent trains have featured the SCT class. Qube�s container services from the WIFT are still being hauled by a single GL class whilst there are reports that this operator will also load grain at Marmalake this month. The Pacific National mineral sands train between Hopetoun and Hamilton retuned for the New Year on Mon.6.1.2014 with the expected double G class motive power and whilst 28 hoppers was the standard consist in 2013, up to 40 hoppers have been reported on at least one occasion. GrainCorp has chosen not to renew their lease over six more sidings on the western Victorian standard gauge network, which include Berrybank, Lubeck, Horsham, Dimboola, Gerang Gerung and Serviceton. The sidings will remain available for stabling track machines but will no longer facilitate the loading of grain trains. Three of these locations (Berrybank, Horsham and Dimboola) are no longer listed as active grain receival sites by GrainCorp but it is anticipated that the other three will remain as part of the company�s grain handling network but will be emptied solely by road transport in the future. This leaves the sidings at Westmere, Marmalake, Dooen, Nhill, Lillimur and Kaniva on the main line, and Jeparit and Rainbow on the branch north of Dimboola, Warracknabeal/Warrackside, Lah, Brim, Beulah and Hopetoun on the branch from Murtoa and Willaura on the Portland line as the only rail served locations in the GrainCorp network in western Victoria. Qube Logistics have joined SCT as rail operators serving the Wimmera Intermodal Freight Terminal at Dooen east of Horsham after coming to an arrangement with terminal operator Wimmera Container Lines. After operating for a period from the rail yards at Horsham station and them moving all of their container movements from the Wimmera to road from a base at the Viterra complex at Dooen they have now become the third rail operator from the WIFT after GWA operated at least one bulk grain train from the facility earlier this year. A DEAL between a Rupanyup grain company and Wimmera Container Line will see 3000 fewer freight movements on the Western Highway each year. Wimmera Grain Company has joined Wimmera Container Line and SCT Logistics to export more grain from the Wimmera by rail. HORSHAM Rural City Council has teamed up with the Southern Grampians and Glenelg shire councils to push for passenger rail services. The city council wants a passenger rail service through the Wimmera to Ararat, where it would connect with Melbourne-bound trains. Trains from the Southern Grampians and Glenelg shires, including from Hamilton, would also head to Ararat. 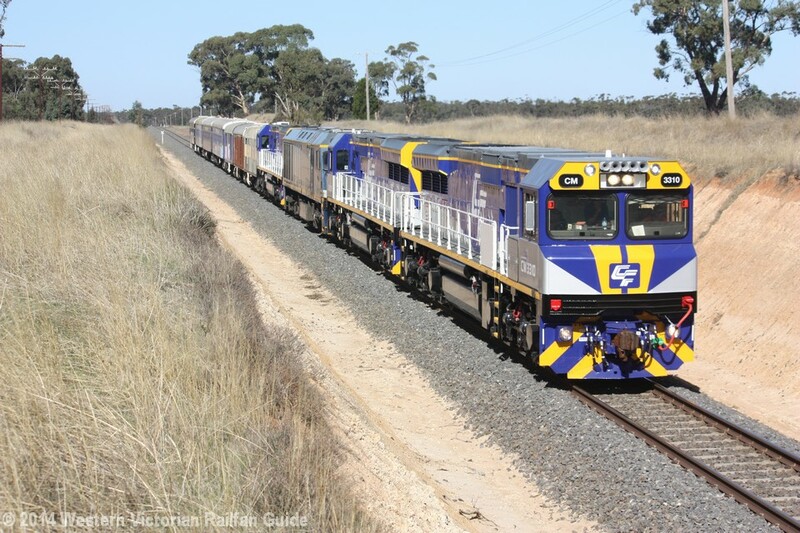 ARTC undertook a ballast program on the western line during the first couple of weeks of September operating from the siding at Glenorchy between Stawell and Murtoa with Qube providing the motive power in the form of their locomotives 8030 and GML10. RELOCATION of the Melbourne-Adelaide rail corridor in Horsham could cost up to $99 million. The study included a new passenger railway station and estimated clean-up work on the contaminated rail corridor would cost up to $19 million. But Horsham Rural City Council chief executive Peter Brown said moving the railway could take up to 30 years. August the 21st 2013 is the 20th anniversary of V/Line's last Dimboola to Melbourne pasenger service which was known as the Wimmera Limited. To mark this occasion we are publishing a series of photographs illustrating this train service in its last months of operation on our Facebook page. Visit our Facebook page at http://www.facebook.com/WesternVicRailfan to view these pictures. You do not have to be member or logged on to Facebook to view these. 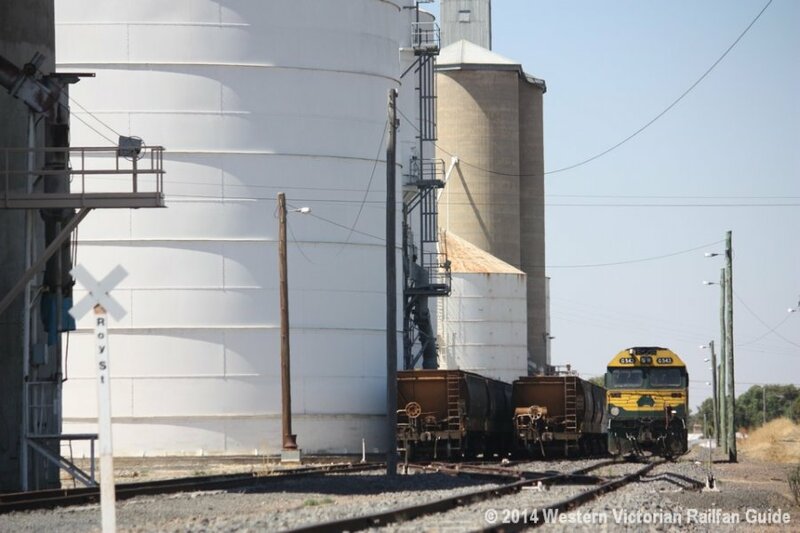 The start of August saw GWA operate four grain trains between locations in the Wimmera and Port Adelaide. One of these became the first train to be loaded with bulk grain at the Wimmera Intermodal Freight Terminal. Whilst Viterra have the contract to build and operate a grain loading facility on the site, this has not yet been constructed so the loading was undertaken using a portable loading elevator and a small fleet of trucks transferring the grain the 1500 metres from the adjacent Viterra grain receival site. Read the full announcement on the Great Souther Rail website here. El Zorro continue to haul grain on the western standard gauge line on behalf of Cargill/AWB, loading at the Dimboola GrainFlow Centre and the GrainCorp terminal at Marmalake (Murtoa) and unloading at the ports or Portland, Geelong and Appleton Dock. RAIL freight operator El Zorro Transport has sought to reassure its customers and backers the business is financially secure. . . .
On the western standard gauge network, El Zorro currently operate the Hopetoun - Hamilton mineral sands trains and grain services between the Wimmera and the ports of Portland and Appleton Dock in Melbourne on behalf of AWB/Cargill. They also run grain services on the broad gauge for the same company. Both of the following locomotives spent some time at Dimboola during October for Crew training purposes. Trains returned to the Yaapeet branch for the first time in a couple of months when XR558 and XR555 teaming up to haul return trains to Rainbow on Mon.18.6, Tues 19.6 and Thurs.21.6. SCT Takeover the Horsham Goods - The last weekend of April saw QUBE operate their last Horsham goods hauled by locomotives 8030-8037-S311. SCT are now the main operator with El Zorro still running the occasional service when there is excess loading. On the afternoon of Friday 23rd December, a grain train derailed near Donald on the Mildura rail line. The train was travelling towards Melbourne when a wagon lost a bogie, ripped up 300 metres of track and blocked the Sunraysia Highway level crossing. Some photos by Railpage� user 'Donald' can be seen at ImageShack. Goods train derailed on Sunraysia Hwy - Herald Sun. THE Department of Transport could reopen the Dimboola to Yaapeet rail line to shift almost 150,000 tonnes of grain from storage before this year's harvest. The future of the line was in doubt after V-Line closed it late last year but the State Government has revealed funding to repair and reinstate the line could be available within months. * - GM36 and S300 headed west with the mineral sands train on Fri.14.8 before assisting a grain service to Mallala and they were shunted off at Diapur overnight on Sun.16.8 to take up the ballast duties. Both GM36 and S302 assisted the Portland mineral Sands train, 9768, into Melbourne on the morning of Fri.20.11, but they both returned west later that day on the return mineral sands service, 9767, to remain available for the ballast workings. The trains delivering the new concrete sleepers for the western line resleepering project operate in push pull mode whilst unloading the sleepers, with two 81 class locomotives being the usual combination. Currently the most common arrangement is for these trains to run from New South Wales with one locomotive and the second unit is added at Maroona before the train continues to the worksite. On the return trip, the extra unit is shunted off at Maroona to assist the next loaded train. Occasionally a double or triple header is reported through Gheringhap when the extra units need to return for servicing purposes. The sleepers are currently being unloaded in the Deep Lead area. The delivery of new concrete sleepers to locations west of Dimboola continues, with the unloading site having advanced to east of Salisbury Loop by Sat.8.8. The motivepower on this day also included the first appearance of a T class on these services - T409 accompanied 8121 in lieu of the usual second 81 class. On Tues.21.7 after the sleeper train had unloaded west of Dimboola, one of the locomotives in the form of 8166 was taken off the train and stabled in the yard at Dimboola before the empty train departed for New South Wales via Melbourne to reload. The plan is that 8166 will be added to the next loaded train upon its arrival at Dimboola the following morning and the train will proceede to the work site in push - pull mode to unload. On its way back the extra locomotive will be stabled at Dimboola in preparation for the cylce to be repeated the next day. It is antcipated that the ballast trains in conjunction with the new concrete sleeper installation in the Miram to Diapur to Salisbury sections west of Dimboola will recommence around the middle of the week starting on the 20th of July, with the ballast loading point moving from Callington in South Australia to Miram or Diapur. Observations on Sat.18.7 revealed ballast stockpiled beside the siding at Miram. In conjuction with the delivery of new concrete sleepers outlined below to far western Victoria, this week sees the start of their installation and a the commencement of a series of ballast trains operating out of Callington west of Murray Bridge in South Australia. El Zorro has the contract to operate these trains and initially C501 and T386 were the motive power. The fourth week in May saw C501 and T386 return to Melbourne, via Portland to assist the mineral sands train, before C501 and 4836 in Austrac colours returned west to resume ballast duties. Pacific National are operating a series of six sleeper trains for ARTC from New South Wales to the west of the state via Albury and Melbourne. The schedule anticipates twelve such trains with one per week from the end of March. Each train is to unload the new concrete sleepers west of Dimboola in two trips, scheduled for Thursday and Friday mornings with a layover at Dimboola in between. This picture is of the first train when stabled in the yard at Dimboola in fading light on the evening of Thurs.26.3. As part of the new contract to rail containers between Horsham and Melbourne, CRT blue locomotive 7334 has been transferred to Horsham to take up pilot duties. Despite the news item listed below indicating that Pacific National and GrainCorp plan the cease rail operations of the Yaapeet branch, a train of 18 empty grain hoppers hauled by XR555 and XR559 operated to the terminus of the line on Tues.22.7. This was the first train on the line since a return light engine movment to Antwerp in June last year, and the last revenue train since March last year when a coule of train loaded at Rainbow. At around 19 30 on the evening of Sun.30.3 the west-bound QRN / P&O service, MA6, hauled by EL58-RL302-EL51 derailed around 24 wagons in the vIcinity of the Emu Creek bridge at Pura Pura damaging 800 metres of track. El Zorro's first grain service from New South Wales to South Australia, via Victoria, thundered through western Victoria in the early hours of Thurs.20.3 fronted by VL356-EL54-EL52-GM36. The first of EL Zorro's grain services hauled by the combination of CFCLA's VL356 and SRHC's GM36 operated to the Geelong Grain Loop on the morning of Sat.9.2 - through Gheringhap on the up at 09 00 and after unloading, retruning west at 12 13. Asciano, the parent company of Pacific National, announced on Wed.12.12 that they would be closing their Victorian rail freight business for commercial reasons. The first of a number of trains conveying barley from Bowmans in South Australia to Marmalake (near Murtoa) operated between Sat.9.12 and Tues.12.12. The trains are loading at Marmalake with grain destined for Port Adelaide and after unloading there are continuing on to Bowmans to re-lead with a different grain before returning and refuelling at Dimboola on the way back. Motive power was G522-8169-9-8171. 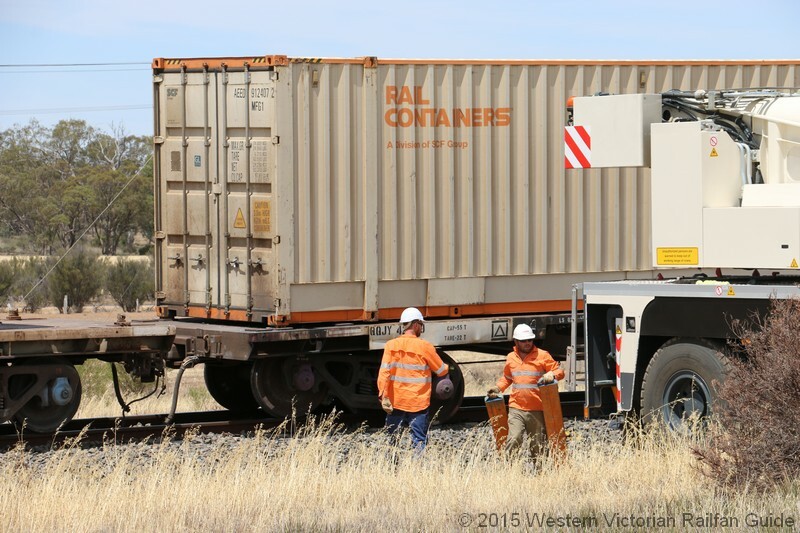 The current pattern of operations is for the loaded ballast train to stable overnight at Dimboola, venture west early the next morning to discharge ballast, before returning to Glenorchy to re-lead and making its way back to Dimboola for the night. Trains operated west of Dimboola each day between Mon.22.10 and Thurs.27.10, to locations between Salisbury and Diapur. Four Dimboola to Port Adelaide grain services were operated by PacNat during the first half of October. The first one departed Dimboola late in the evening of Tues.3.10 behind 8166-8160-8165. The following trips operated ex-Dimboola on Thurs.5.10, Sun.8.10 and Tues.10.10. - Fri.13.10. A ballast program is anticipated during October following the stockpiling at Glenorchy and a notice in the Wimmera Mail-Times on Mon.25.9 placed by Works Infrastructure informing local residents of the intention to store ballast and load trains at the Glenorchy siding between the hours of 7.00 am and 6.00 pm for approximately one month beginning Tuesday 26th of September.- Mon.9.10. Pacific National will be operating a cycle of four trains conveying barley from the Dimboola GrainFlow Centre to Port Adelaide, with the first one to load on Wed.23.8 and depart in the early hours of the following morning. The following three west-bound departures are anticipated to be late Friday night and early Monday and Wednesday mornings. On the morning of Thurs..25.5 a truck collided with the side of a train, AM3, near Lismore in western Victoria, derailing two locomotives and around 40 container wagons and burying the truck. It is anticipated that the line could be closed for four or more days, with some services between Melbourne and Adelaide diverted via New South Wales. The ATN grain train returned to the Dimboola GrainFlow Centre in April. Fri.21.4 saw the unusual, but most welcome, sight of a T class leading the down ATN grain service to Dimboola. T371-T379-8166 (both T's long end leading) hauled the empty train, with 8177 joining them for the return trip, after coming west on 9791 that morning. 8177-T371-T379-8166 on a down ATN Access grain train on the morning of Thurs.13.4. Dimboola, Gerang Gerung, Glenorchy and Miram on the main line. GM36 made its first visit to western Victoria when it combined with G519 to haul the down Horsham goods, 9791, on Tuesday the 11th of April. ARG operated two grain trains between the Dimboola GrainFlow Centre and Appleton Dock in Melbourne early in March. Locomotives CLF4-GM42-CLF2 hauled both trains consisting of CFCLA CGAY hoppers and one crew car. Loading occurred on Wed.1.3 and Thurs.2.3. Dimboola's rail tractor, most recently RT28, was withdrawn some time between late January and the end of February, leaving this location without a resident pilot. With the increased tonnages of grain loaded at the AWB GrainFlow Center west of the town there has been reduced need for a rail tractor to shunt grain wagons at Dimboola itselt. The intra-state goods services on this line are currently running five days per week - Sun, Tue-Fri (9791) and Mon-Fri (9792) - up from once per week for much of last year. A cycle of ATN Access grain trains operated between the AWB GrainFlow Centre at Dimboola and Appleton Dock in Melbourne utilizing a number of former New South Wales locomotives during early February. Thank-you to the Gheringhap Loop web site for confirmation of the above locomotive combinations. Locomotive GL105 was shunted off *SP2 on the evening of Mon.22.8 and stabled at the turntable at Dimboola - it is assumed that it was there for crew training - it was collected by train MA3 on Fri.2.8 and taken on to Adelaide. - Sat.3.9. Front Page Artcile in Wimmera Mail Times on Friday 12th August. Cs2 departed Dimboola on the morning of Wed.11.5, bound for New South Wales via Melbourne - Wed.11.05. ARG loaded a grain train at the Dimboola Grain Centre on the morning of Tues.10.5. - the train departed at around 11 40 bound for Adelaide - Tues.10.05.